There has been a lot of coloring over here. Tremendo has started coloring and writing some letters too. The letters he’s written so far are M, L, and the first letter of his name. He really likes M and L because of Mario and Luigi. We’ve been working with Handwriting Without Tears‘ wood sticks. Tremendo is coloring spiderman red and green. For years Kamikaze called crayons, “colorings”. Sometimes it still slips out. Kamikaze has been coloring in coloring books in their entirety and then individually ripping the pages out. Perhaps he prefers to put them in his own order? Well, since they’re not bound together anymore there is always an occasional page flying loose somewhere. When he comes across one, Tremendo likes roll it into a tube and carry it around. I imagine he’s pretending they’re treasure maps. We’ve resorted to calling them colorings. 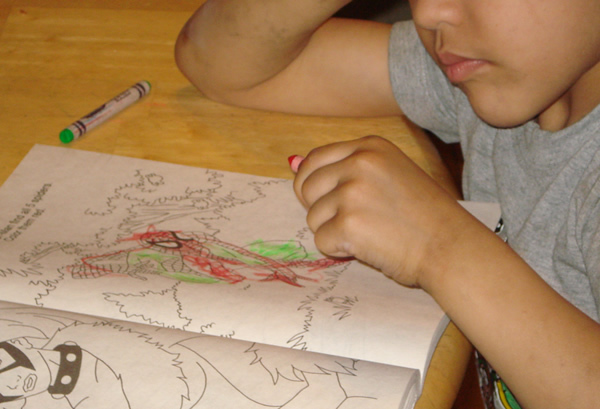 Coloring book pages or sheets just doesn’t sound as good.